As per American Academy of Dermatology, almost 7.5 million people around the world are suffering from Psoriasis. (1) It is a non-contagious and auto-immune condition that results in scalp, itchy and red patches of skin on different parts of the body – most commonly on arms, lower back, knees and elbows. People suffering from psoriasis produce new skin cells at a rapid pace, yet the shedding of dead skin cells stay normal. This leads to the accumulation of new skin cells under the present skin. These changes are occurred to inappropriate response by immune system. There is no permanent cure for psoriasis. However there are many sources of controlling to maximum extent. Many prescribed medicines are either expensive or have some severe side effects. If you want a natural solution to control the psoriasis flare-ups then turmeric is the answer you are looking out for. 2 How Does Turmeric Treat Psoriasis? 3 How to Use Turmeric for Treating Psoriasis? As per a study published in European Journal of Dermatology, people were put on oral curcumin and visible light therapy. The results concluded that this combination can be a safe therapy for treating mild to moderate psoriasis. How Does Turmeric Treat Psoriasis? Curcumin an important component is responsible for most of the beneficial properties in turmeric. Boosts Immunity: The presence of lipopolysaccharides make the turmeric an immunity booster. It raises the white blood cells count to stimulate the immunity. Detoxifier: It protects and detoxifies the liver from toxic damage by cleansing the blood to prevent impurities. There are different turmeric treatments for controlling the psoriasis flare-ups. We have mentioned them below with step-by-step instructions. The curcumin present in turmeric is not easily absorbed by our body. Taking black pepper or bromelain (present in pineapple) helps our body absorb the curcumin. That is why, we use black pepper in this process. Into 4 cups of water, add 1 teaspoon each of turmeric and black pepper powder. Bring the mixture to boil and simmer for 10 minutes. Remove from flame and let the mixture cool down to room temperature. Add a teaspoon of honey or lemon juice and consume it. Repeat the consumption daily to treat psoriasis from inside. Alternative Method (Turmeric Drink): This is an immune boosting drink which helps to controls several health complaints including psoriasis. Add 1/2 teaspoon turmeric powder into a glass of warm milk. Consume it daily before going to bed. This acts as an ointment for treating itchy, scaly and redness caused by psoriasis. Apart from that it also helps to reduce the inflammation and pain in the joints caused by psoriatic arthritis. Mix enough amounts of turmeric and water. Spread a thin layer of the mixture on affected areas. Wrap a cheese cloth or gauze around it and leave it overnight. Next morning, remove the gauze and rinse off with warm water. If you are worried about turmeric stains on the skin, don’t worry they will disappear in few hours. Alternatively, use honey instead of water. Alternative Process: Mix 1 part turmeric powder and 2 parts water. Bring the mixture to boil and simmer until a thick paste is formed. Remove from the flame, let it cool and refrigerate the mixture. Apply the mixture on the affected areas and leave it for 20 minutes. Rinse off with water. If you are looking out for an ointment or cream for reducing the pain in psoriatic arthritis or to reduce the redness on the affected areas then this process works very effectively. Mix enough amounts of turmeric and butter or ghee (clarified butter). Leave it overnight and rinse off with water next morning. Repeat the application once in a day. Bring 1 cup of water to boil and add 1/4 teaspoon turmeric, 5 drops of olive oil, 5 strands of saffron, a pinch of black pepper and a pinch of ground ginger into it. Keep stirring for few minutes and remove from the flame. Let it cool down for 15 minutes and consume it. Combine quarter teaspoon each of turmeric and cumin powder. Add enough amounts of water into it to make a paste. Apply the paste on affected areas. Rinse off with water after 15 minutes. Follow the process daily to get relief from psoriasis flare-ups. Alternative: you can add turmeric and cumin powder to a glass of warm milk and consume. Grind a handful of neem leaves with a pinch of turmeric. Let it rest for an hour and rinse off with water. Alternative Method: Mix 1 teaspoon neem powder and 1/2 teaspoon turmeric powder. Consume this mixture with a glass of water. Repeat the process daily until the symptoms of psoriasis reduce. Allicin, the active component of garlic contains potent anti-oxidant properties which help to block the kappa B activation that can trigger the inflammation in psoriasis. (18) Garlic also contains immune modulating function and increase antioxidant defenses. Using a mortar and pestle, crush 1 garlic clove and a pinch of turmeric. Consume this mixture followed by a glass of water. The fatty acids present in coconut oil enhance the communication between the skin cells and also increase the cell durability. Consuming at least a teaspoon of coconut oil daily helps to improve the body’s resistance power. Combine 1/2 teaspoon turmeric with 1 tablespoon coconut oil. Rinse off with water after 2 hours. Repeat the application daily to achieve the results. Mix 1 tablespoon turmeric powder, few drops of water and 2 tablespoons of olive oil. Soak gauze in the mixture and place it on affected areas. Leave it on for 45 minutes, remove and rinse off with water. Mix 2 tablespoons of aloe vera gel and 1/2 teaspoon turmeric powder. Continue the application daily for effective results. Combine bromelain extracts and enough amounts of turmeric powder. Mix well and slather the mixture on affected areas. Leave the application on for few minutes and rinse it with water. Pat dry and apply any moisturizer. Natural moisturizers like coconut oil, olive oil or shea butter are the best options. Ar-tumerone, a compound present in turmeric oil has strong anti-fungal properties which combat with skin infections. This process can be used to treat psoriasis on face, neck, hands, knees, legs and other parts of the body. Massage enough amounts of turmeric oil on the affected areas for few minutes. Leave the application for few hours to overnight. Rinse off the application with lukewarm water in the morning. Pat dry and apply any natural moisturizer on it. Continue the process once in a day to get quick relief. Are the psoriasis rashes on face and neck causing embarrassment and depression then try this amazing method to reduce them quickly. Combine 1 tablespoon neem powder, 1 teaspoon of turmeric powder, 5 drops of lavender essential oil and 1 tablespoon of honey. Mix well and spread the paste on the affected areas of face and neck. Leave it on for 20 – 30 minutes or until it dries completely. Mustard oil contains antiseptic, anti-inflammatory and soothing properties. The combination of mustard oil, turmeric and fenugreek seeds makes an amazing lotion to reduce the rashes and redness of psoriasis flare-ups. Boil an inch piece of turmeric in a cup of mustard oil. Add 1 teaspoon of fenugreek seeds in the oil. Allow the oil to cool down and preserve the oil. Spread this oil mix on the affected skin areas daily. Rinse it off with warm water and pat the skin dry. Apply moisturizer and do the same process regularly. For people suffering from psoriasis, soaps are often a matter of concern. The harsh chemicals can dry out and harm the skin. 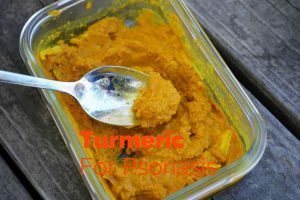 With this recipe, you can prepare soap using turmeric which treats psoriasis. Cut 6 cubes of soap base and melt them using a double boiler. Remove from the flame and add 1 teaspoon turmeric, 1 tablespoon olive oil or coconut oil, 3 drops neem oil and oatmeal. Pour the mixture into soap moulds and let it sit for 3 hours. Use this soap instead of chemical based soaps. Using turmeric in tincture form is also effective in treating psoriasis. You have to take about 1 teaspoon of turmeric tincture for 3 times a day. Or pour 30 – 40 drops of tincture in 1 oz of water and drink this after stirring for thrice daily. There are two types of tinctures available – water and alcohol base. The alcohol content is used to extract the full benefits of the turmeric herb and for proper preservation. You can also choose the one which has no alcohol content. But make sure to follow the instructions before using it regularly. Tincture can also be applied underneath the tongue that helps to bypass the digestive tract and thus go straight to the bloodstream. Regular intake of turmeric tincture will definitely help to clear psoriasis from inside out. But don’t overuse as it can have severe side effects. If you don’t like the taste of turmeric then the alternative solution is to take turmeric tablets. The recommend dosage is 1000 – 1200mg per day. As you already know that curcumin alone cannot be absorbed by our body so you have to take bromelain or bioperine tablets to enable the absorption. This product comes with 120 capsules with 500mg of curcumin. You have to take 2 capsule per day. As it already contains bioperin compound, you don’t need to take any other tablets for curcumin absorption. Avoid turmeric usage if you are allergic to it. Avoid soaps, shower gels and shampoo that contain harmful chemicals. Avoid wearing tight clothes and prolonged sun exposure as it can worsen the problem. Use natural moisturizers like coconut oil or almond oil to avoid dry and itchy skin. Consume foods that are rich in anti-oxidants and plenty of water. Avoid gluten, red meat, excess fat, sour and salty foods, alcohol and smoking. If you are pregnant or breastfeeding then it is better to avoid turmeric consumption. Turmeric can stimulate uterus, lead to vaginal bleeding and encourage menstruation. If you are suffering from gall bladder issues then turmeric may worsen it. People with diabetes should avoid its consumption as it can lower blood sugar levels. Turmeric can interfere with certain medications like blood thinners, acid reducers, anticoagulants and diabetes medications. So, it is better to avoid turmeric if you are taking them. Turmeric consumption should be stopped before 2 weeks of surgery as it can cause internal bleeding. Do you have any other remedy that works great in controlling the psoriasis flare-ups? You can share your experience and queries in the comment section below. We will reply as soon as possible. Hello my husband is psoriasis patient it worsen now a day’s because of reaction of medicine name emflox. Is it good for him to use turmeric.